I promised an amazing color today, and by god I will deliver! I have been in love with this color since first opening the box of swatchin' things. I even hinted at this one on instagram. I have found that special color that will transform me into a majestic unicorn. This color is the last third of the trio I shared with you yesterday. La Luz is by far my favorite, which is why it got its own post. I ended up wearing this two separate times. It was just a joy to apply and so wonderful to wear. I could swear that I had some eyeshadow that matches this...right down to the strong blue flush. Formula-wise, this just couldn't be better. It is a warmer iris purple with a striking blue undercurrent. By itself this would be a beautiful polish...so of course Demi had to go further. In addition to the normal awesome, there is a scattered holo and holo glitter sprinkled liberally throughout. So yeah. This one...it is magic. Can you believe this is only a two-coater?! I want to paint my house in this shade, but I've been informed that I won't be sold all of the polish. Dammit. This color is a must-have for spring/summer. It just makes me happy to wear it. It is easy to apply, sparkly, and fun. Head on over to Baroness X and grab one before I buy all of them for myself it runs out. Oh, and in the interests of coordination...LOOK. 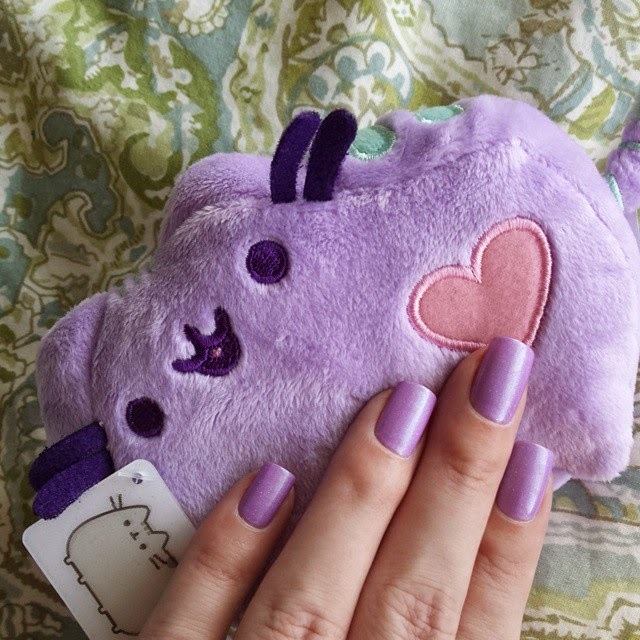 IT MATCHES PUSHEEN. OMG YA'LL. If for no other reason than this, you should go buy it. Look how happy he is! He wants you to buy it. He does. Be one with the Pusheen!